The best things in life are often the simplest. Bread pudding is one of those things. 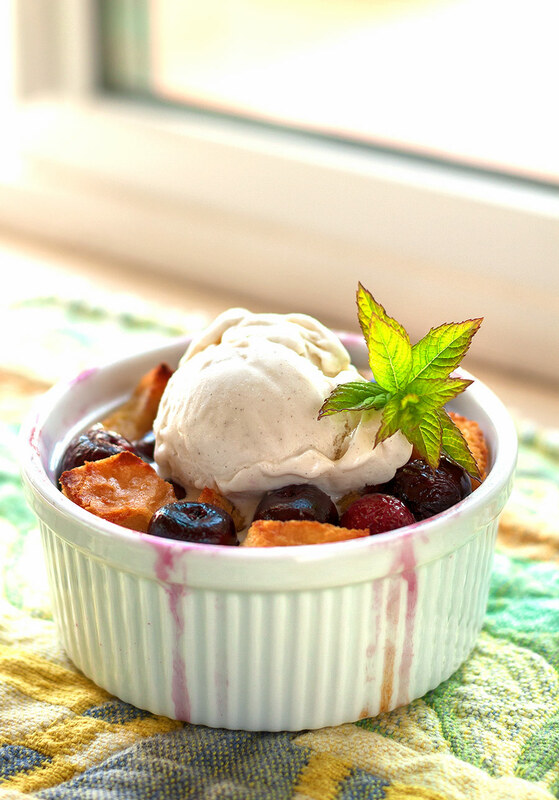 Bread pudding is something of a blank canvas for the creative cook. Made from a handful of ingredients that are found in almost every kitchen – milk, eggs, butter, sugar and leftover bread – bread pudding is one of the most basic comfort foods that there is. With the addition of a few spices and flavorings, the variations are infinite. 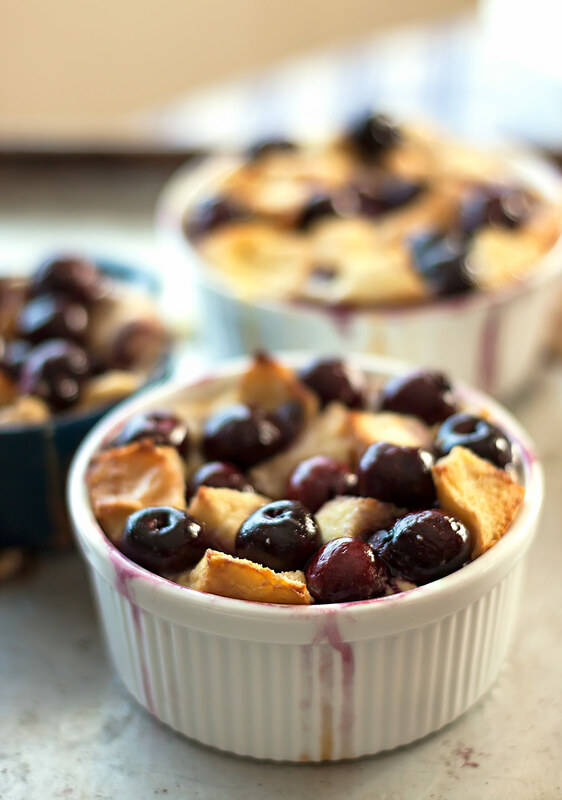 Easier to make than a tart or clafoutis, bread pudding is the ideal way to enjoy the flavor of that most summery of fruits, fresh cherries. The ingredient list couldn’t be less complicated – a dash of cinnamon and vanilla are all it takes to highlight the bright, cheery taste of the sweet fruit. And while you can use something fancy, like brioche, we actually prefer to use day old baguette as the perfect base to soak up all of that deliciously eggy custard. Enjoy it straight out of the oven, when it’s just cool enough to eat without burning your mouth and it will be tender and light as a feather – or let it cool and firm up to a pudding-like consistency. 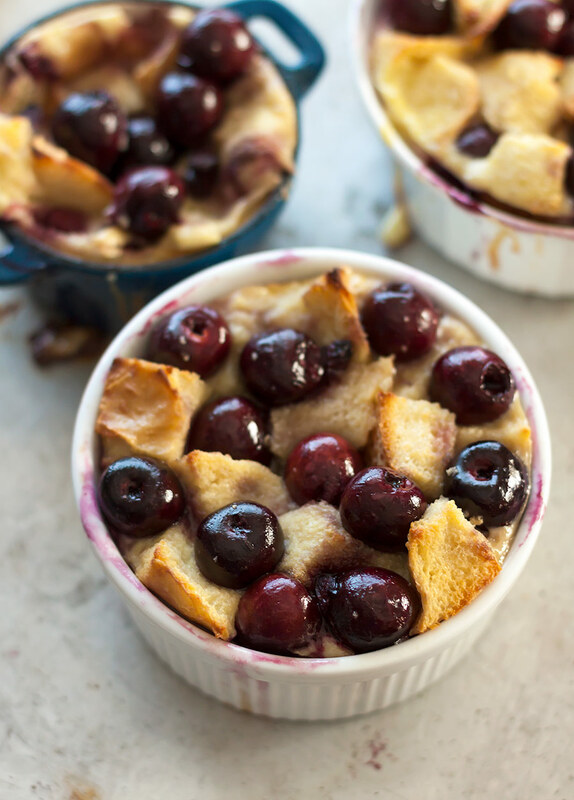 Either way, cherry bread pudding is a homey treat that appeals to the kid in all of us. 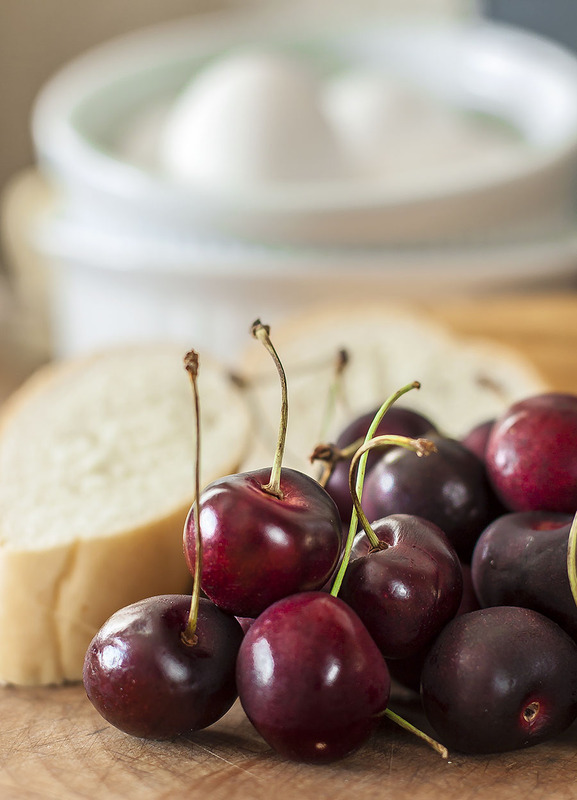 While sweet cherries are readily available at the grocery store, we prefer to use handpicked, tree-ripened fruit for all of our recipes – and for eating fresh out of hand. If you don’t have a farm stand selling fresh cherries in your neighborhood, you can order both sweet and tart Balaton cherries in season from Earthy Delights. Slide the bread pudding into the oven and bake for 35 – 45 minutes (depending on the size of the pan) or until the top has puffed up and is golden brown.